A little book and yarn shopping …. …. after nearly a year of unemployment and being very careful. Not too much, because I already have books and yarn aplenty, but just a few very lovely things that I really couldn’t resist. 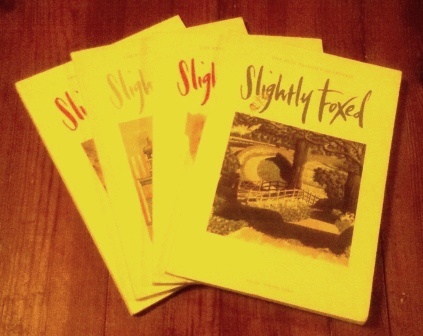 Back issues of Slightly Foxed! I very nearly squealed because the edition with the Leo Walmsley article was there. And now I definitely feel a subscription coming on …. I really didn’t expect to see the three Dodie Smith novels that were only reissued earlier this month in The Works, but there they were, priced at three for £5. A wonderful bargain, but I was a little sad that they were being sold so cheaply so soon. I snapped up The Town in Bloom, It Ends With Revelations and The New Moon With The Old – I can already vouch for that one, and it’s lovely to have a copy of my own now that the one I read has gone back to the library. And that’s it for book shopping …. for now at least …. And when I saw that the yarn came from the wonderful Skein Queen and that she had mitten kits in stock I really couldn’t resist. So that’s my next small project lined up. And on Monday we have to go to St Ives, so I’ll have my first chance to look at the Oxfam Bookshop for a while. And I shall take my birthday book token, that I’d forgotten I had, just in case I should spot something in the St Ives Bookshop …. Just pea green about your Dodie Smith finds. I just finished “The New Moon with the Old” and loved it. The Slightly Foxed edition of her “Looking Back with Love” just landed in (they reprinted only the first volume of her memoirs–apparently there are three more out there somewhere). I have been a subscriber to SF for several years now and am in the process of slowly buying up the back issues–the reviews make the best bedtime reading! So I commend you on your brilliant acquisitions. 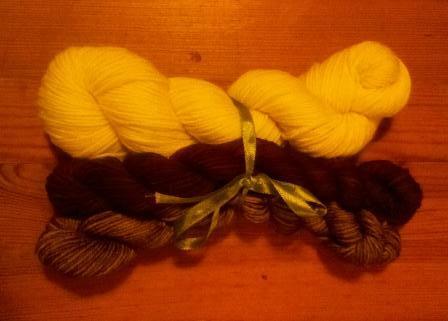 The yarn looks lovely too. A good day! That 3 for 5 deal on the Smith reissues is ridiculous but it also makes me incredibly jealous! I only bought a subscription to Slightly Foxed at the beginning of this year but I’ve been checking out back issues from the library and have adored every single one that I’ve been able to get my hands on. It is such a delight to read! How nice Fleur. 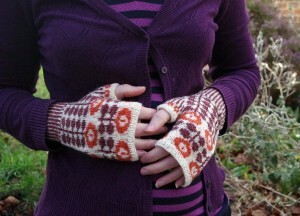 I knit too but I seem to have a lot of single skeins hanging around at the moment. I’m looking for a book/some patterns that has interesting projects that only use up one ball. Do you have any recommendations? The three books are such a bargain! also good luck with the gift cards!